we learn to perform theater. 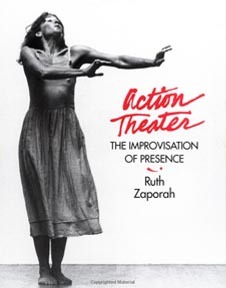 Zap Performance Projects is pleased to announce the publication of Ruth Zaporah's ACTION THEATER: THE IMPROVISATION OF PRESENCE, published by North Atlantic Books in Berkeley, California. Ruth Zaporah is an internationally renown teacher and innovator of Action Theater, an improvisational form that unites movement and acting into congruent expression. 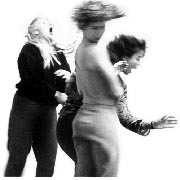 For over 25 years, Zaporah has trained people in Europe and the United States -- actors, dancers, musicians, and all who explore the relationship between mind, body, action and performance. Packed with over 100 skill-building exercises and illustrative photographs, ACTION THEATER: THE IMPROVISATION OF PRESENCE is an indispensable training manual. This exciting new book examines the process of improvisation as it outlines one of Zaporah's intensive twenty-day training programs. Her writing, clear and articulate, fills each chapter with detailed discussions, anecdotes and examples of the inner process of improvisation based on embodied awareness. Improvisation is a life-reflecting process. How one responds to the experience of life is consistent whether on or off the stage. Through Action Theater practice, students move away from preconceived ideas and their accompanying restrictions and learn to focus attention on the body's awareness of the present moment. From an empty, open self all things are possible. Different than most improvisation trainings, Action Theater doesn't set up lifelike situations. Instead, lifelike and non lifelike situations arise through physical explorations within forms and frameworks. The forms are open, content-less and address how we organize specific aspects of behavior or experience. They invite us to inhabit our bodies, deconstruct our normal behavior and, then, notice the details of what we've got. We become more conscious of our moment to moment thoughts, emotions, feelings and fantasies, in addition to the outer world we inhabit. The Action Theater process offers a way towards lively, spontaneous, embodied expression. The techniques invite exploration into the direct experiencing of sensation/feeling/ action. They address comprehensive and diverse skills: the relationship between body and speech, the craft of expression, ie, time, space, shape, dynamics, how to spontaneously build monologue or dialogue, solo, partner and ensemble dynamics, the relationship between form and content, and how to shift or transform attention so perception is fresh. Students learn to spread open moments revealing detailed options. They increase the ability to hold and express emotion, learn how to embody action, to elicit images from an enlivened imagination, and to recover lost personal material. Dancers, release from technical and stylistic desensitization, and open their physical, vocal and verbal imagination. Actors, brought into their bodies, discover their individual presence. Every exercise creates a reciprocation between exploration, imagination and communication. In a larger sense, every exercise speaks to the relationship between intention and awareness and expands the possibilities of both. The work is appropriate for anyone, novice or experienced, interested in the relationship between awareness, action and performance. Open this book to any page. Words that are relevant to any art form leap out. " We're purposefully manipulating the dynamics of our actions so that we can experience ranges we may not normally reach. After enough practice we can stop bothering to make it so hard. A range of dynamics will become part of our expressive language ready to respond to our inner experience." "When we go inside of crying we become foreigners to it. We're no longer in the familiar of crying. Think of it. If we focus on the actual experience of crying we become a landscape of sound, energy, movement, weight. We're present." "If one tours one's inner landscape with awareness, inhabiting all experiences as they arise, then one discovers that what was once feared is not at all fearful."